The composition of parliament’s standing committees has been approved today with the ruling Progressive Party of Maldives (PPM) and coalition partner the Maldives Development Alliance (MDA) securing a majority on key government oversight committees. 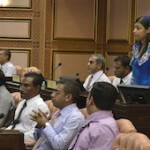 The seat allocation on the 13 standing committees was decided by a five-member select committee – chosen at the first regular sitting of the 18th People’s Majlis earlier this month. Opposition Maldivian Democratic Party (MDP) select committee member MP Ibrahim Shareef, however, walked out in protest after claiming his party had not been adequately included in the decision. Prior to today’s meeting of the select committee, political parties had been unable to reach an agreement on the committee composition as a two-week deadline stipulated by parliamentary rules elapsed last week. A proposal by MDA MP Ali Mauroof to have 11 members on each standing committee with the exception of the ‘241’ security services committee was passed with the support of Jumhooree Party (JP) Leader Gasim Ibrahim and Adhaalath Party MP Anara Naeem. The ruling coalition with its 43 MPs secured a majority on the public accounts committee, government oversight committee, independent institutions committee, national security committee, and economic affairs committees with five PPM MPs and one MDA MP on each committee. Former coalition partner JP was allocated two slots on each oversight committee. The opposition MDP with its 25 MPs was meanwhile allocated four seats each in the government accountability committee, rules committee, and petition committee and three seats in the other ten committees. On the security services committee, the select committee decided to allocate four seats for the PPM, three seats for MDP, two seats for JP, and one seat each for the MDA and Adhaalath. The sole remaining independent MP, Muaz Mohamed Rasheed, was also given a seat on the 241 committee. Concluding today’s meeting of the select committee, Chair MP Riyaz Rasheed said the committee report will be forwarded to the Majlis floor for approval. Parliamentary proceedings had been stalled pending the constitution of standing committees. A regular sitting has meanwhile been scheduled for tomorrow (June 17). Speaking to reporters following the select committee meeting, MDP MP Shareef declared that the minority party would not participate in the standing committees. The committees were constituted “unjustly” without the participation or input of the main opposition party, Shareef said. “We will protest in the chamber and we will take to the streets too if we have to,” he warned. Shareef had warned at a press conference yesterday (June 15) that the MDP would be forced to resort to direct action or street protests if the party was unable to hold the government accountable through parliament. An opposition majority on government oversight committees – the public accounts committee in particular – was international best practice, he noted. Shareef argued that the opposition party could not exercise proper oversight over public finances without control of the public accounts committee. The PPM was however unwilling to concede seats on the key oversight committees, he said. PPM parliamentary group leader, Ahmed Nihan, had told local media last week that the coalition wanted majorities on the oversight committee to ensure that opposition MPs are unable to obstruct the government. Great! Don't ever let there be peace in Mordis. People, either out of natural luck or by sheer ignorance, are faced with this bitter rivalry amongst ourselves, we yearn for violent reprisals against each other. Lets hope this causes the government not to use gangsters to bring about the change they want. You wanted democracy Mr. Shareef, so why not live by it. You asked for it and you got it. Your wish is granted so digest it.